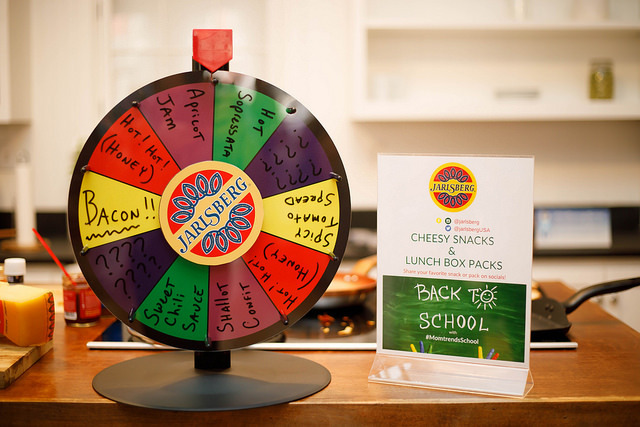 mommygorjess: Back To School Bash with MomTrends! 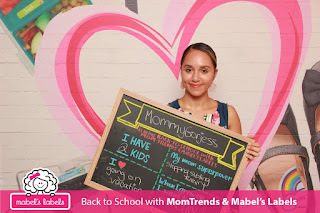 Back To School Bash with MomTrends! Just weeks away from school starting, and I am so happy to be semi-ready. 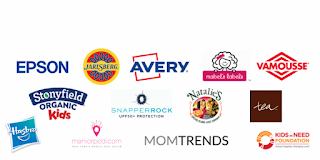 I believe this year will be a great year, and what makes a great year is organization, and Mom Trends helped me focus on that importance by sharing with me some amazing back to school must-have companies to make my school prepping easy breezy. 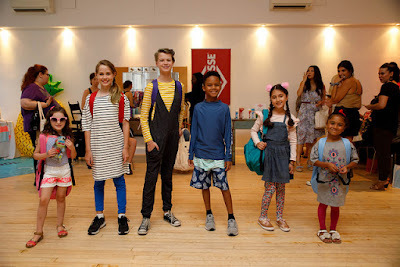 From help with lunch box ideas to awesome looking clothes for them to rock out in. 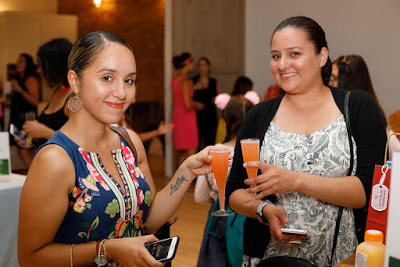 I had such a great time at this event, but what I loved most was being able to meet with brands that I have been working with for quite some time, and putting a face to the name is always a great feeling. As a mom, we stress out so much about our kids going back to school. Partially awaiting the freedom, but at the same time not quite ready to fully let go. At least that's how I feel most of the time this time of year comes around. But when you have great products to look forward to using it always feels a lot better. 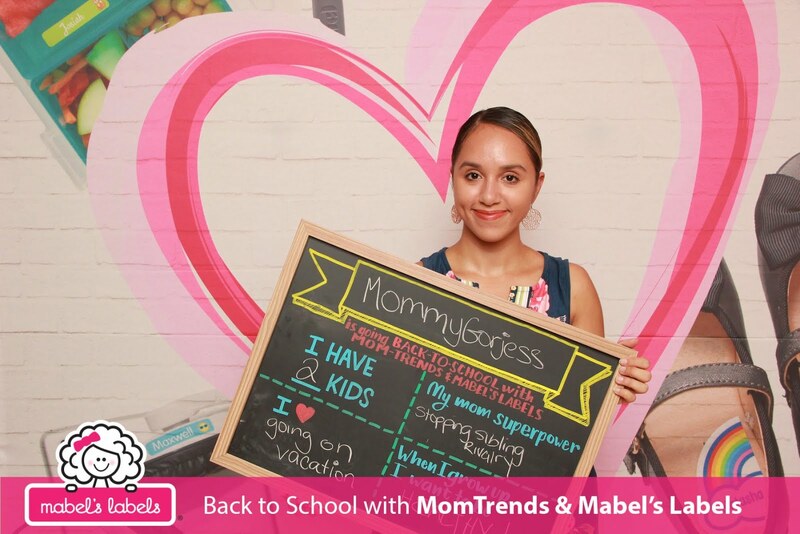 Here are some of my favorite moments from the Mom Trends Back to School Bash! Mabels Labels is just always going to be an obsession for me. Honestly, I can't get enough of these labels. Absolutely everything around my home is labeled. EVERYTHING. It is something I just do now out of habit. We get a new water bottle, and I instantly go and grab the labels. We pack for a trip to the beach, I make sure every single thing is labeled. If you have more than one child then you understand why labeling is a huge deal for me. These kids will fight over everything and anything, so with labels, it's very obvious for them to notice what is who's, we even have them on their toothbrushes. We got to try out some yummy grilled cheese sandwiches with a twist made by Chef George Duran with Jarlsberg. I'm telling you it was the best grilled cheese, ever. And I got some pretty fun and interesting ideas for lunch box planning. I spinned the wheel the first time and I got the spicy tomato spread, it was like the wheel knew me, so well. I absolutely LOVE adding spice to my meals, hot sauce all the way. It was just a perfect combination. I won't even lie, I went for a 2nd try because one just wasn't enough. The second time around I got the apricot jam and I am so happy I did because I will be making it over and over. I truly believe it is something both of my boys would love too, so it will be added to my list of things to make for school lunch now! 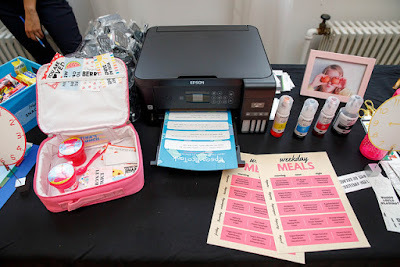 Epson came out with a printer called Eason Eco Tank which should be on every mom's wishlist. It is a cartridge-free so you save time and money. It includes up to two years of ink in the box. So you no longer have to worry about running out of ink on the night before a big project is due. I am a full-on DIY mom, birthdays, holidays, you name it. I am always making something because I just love being extra like that, which is perfect for all my extra mommas who go above and beyond without any reasons. From lunch box notes to a chore chart. And then, there were cocktails. And they were DELISH. Thanks to Natalie's Orchid Island Juice. Natalie’s keeps it simple, which is why there are never more than five ingredients in each juice. No preservatives. No artificial ingredients. No GMOs. It was such a fruity and refreshing taste. I got to try the Orange Pineapple and the Blood Orange. I cant even pick a favorite because I genuinly loved them both so much. I brought home a couple of their small jugs of Orange juice, and my boys drank them up in minutes. Let me remind you how picky my little rugrats are about food and drinks too. I knew they would love it because it doesnt have that tardy acid taste like most orange juices, it's perfectly sweet, but without all the sugar artificial flavoring that is not good for them. It is a perfect morning go to to refresh them for a new day. It wouldn't be a Mom Trends event without a little pampering for the mommas. They had ManiorPedi there to spoil us with a manicure which I needed badly. I loved how fast yet efficient they were. It was definitely the pick me up that I needed to feel a little more like myself again. As a mother of two boys, I feel like me time is so hard to get, so a manicure rarely ever happens because that means I have to actually get out of the house, without my children. I'm that mom who does just about everything with their kids attached to their hip, but having them hanging out at a nail salon I know would be a terrible idea. So I love that ManiorPedi comes to you, and help you get what you want done in the comfort of your own home, or even at work during your lunch break. Its a great service for on the go or working mommas who just want to feel like they have it all together still. I know that a manicure for me makes me feel like a brand new woman and not like the mom who wears sweats and a dad hat every day. So I was glad to learn more about them. We were also given a really cute fashion show by these little ones as they showed us all the fun and stylish Tea Collection back to school pieces that are out now. I loved it all, and I knew I wanted to get the boys a couple of things from the collection. I actually got home and instantly ordered them some bright and fun tee shirts that they chose themselves with me. The clothing is also very comfortably made! 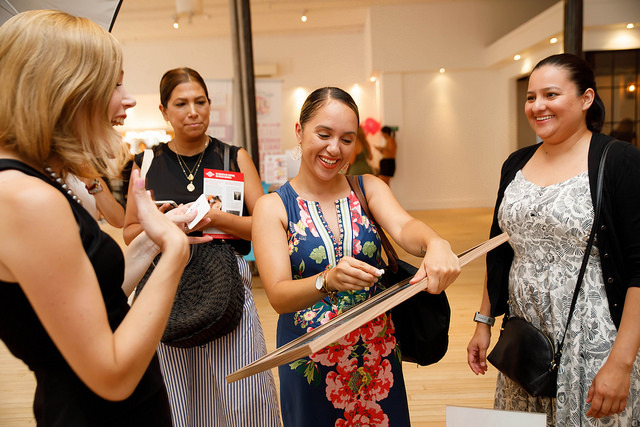 All in all, it was a perfect event, and they somehow hit the nail on all things back to school. I loved that it wasn't all just supplies, but things we didn't think we would need and now I can't picture going back to school without all these things. Big shout out and thanks to Mom Trends for this event, and to all the amazing sponsors. Below are all the sponsors that were there and helped make this event a great one. Lastly, click on the link below to donate to the Kids in Need Foundation. Have you ever thought of what it’s like to go to school without the supplies you need? Children need these core school supplies to be successful in school. Now, think of the burden upon parents to make sure their child has the supplies they need in addition to providing food, clothes, and shoes. It can be overwhelming especially when money is tight. More than 16 million kids live in poverty in the U.S. and arrive at school without the supplies they need to learn. We want to alleviate some of the burdens and help children be successful in the classroom. Help us level the playing field as students return to school. The Sweetest Day At Candytopia NYC! Ready for School with PediPed + GIVEAWAY!